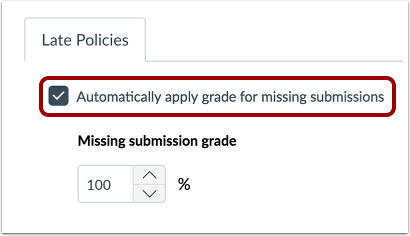 The Missing Submission policy lets you automatically apply a grade for all missing submissions in the New Gradebook. A submission is labeled missing when the due date has passed and it has not been submitted. Only submissions with a status of Missing will be affected by the Missing Submission policy. The Missing Submission policy is set per course. The Missing Submission policy allows you to define a grade that will be granted for missing submissions as a percentage of the total points possible. The percent entered is multiplied by the total points possible on the assignment and the resulting value will be awarded to missing submissions. For example, if the Missing submission grade is set to 20% and the assignment is worth 10 points, all missing submissions for that assignment will be awarded a grade of 2 points (10 points possible x 20% = 2 points awarded). To award all missing submissions with a grade of 0, the Missing submission grade can be set to 0%. If a submission is received after the due date, the Missing label will be automatically replaced by the Late label. However, any label can be manually removed in the Grade Detail Tray. Setting a Missing Submission policy affects all assignments in a course, including assignments with due dates in the past. To exclude a specific assignment, mark the submission as something other than Missing in the Grade Detail Tray. Applying a missing submission policy will not affect previously graded missing submissions. Therefore, the Missing Submission policy should be set up when a course is created prior to creating assignments. The Missing Submission policy will not affect submissions in closed grading periods or submissions for concluded enrollments. The Missing Submission policy will not be automatically applied to No Submission or On Paper assignments. However, a Missing label can be added in the Grade Detail Tray. 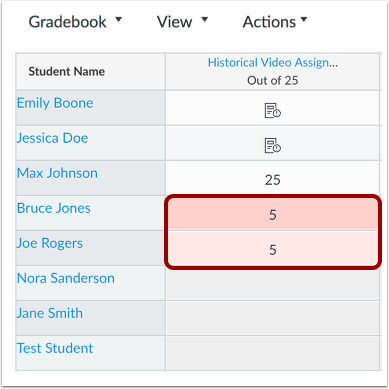 Enabling a Missing Submission policy in the New Gradebook will remove the option to revert to the old Gradebook. Click the Automatically apply grade for missing submissions checkbox. Selecting this checkbox will automatically apply the grade you set for any missing submissions in the course. Set a percentage in the Missing submission grade field. In the Grade Detail Tray, you can view details about the submission. 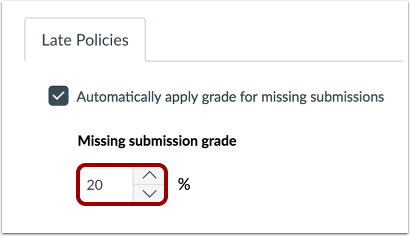 When a submission applies to a missing policy, the Grade Detail Tray displays the given grade. To remove the late penalty from a submission, enter a grade in the grade field. Once a grade has been manually assigned, the Missing submission policy will no longer apply. Please note that manually entering a grade will not remove the Missing label. To remove the Missing label, choose a status other than Missing in the Grade Detail Tray. 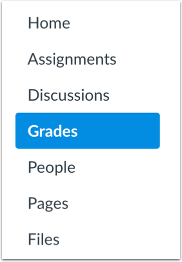 Previous Topic:How do I set a default grade for an assignment in the New Gradebook? 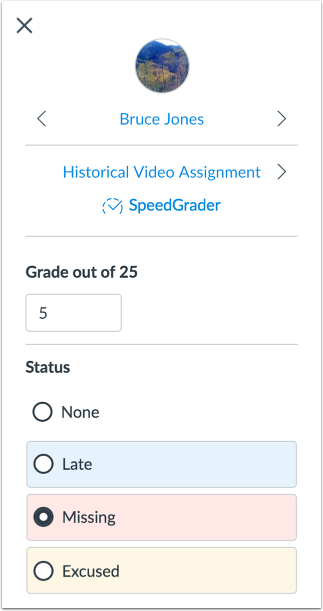 Next Topic:How do I apply a Late Submission policy in the New Gradebook? Table of Contents > New Gradebook > How do I apply a Missing Submission policy in the New Gradebook?